As the global leader in made to measure apparel, INDOCHINO has developed the shopping experience of the future. Born out of the belief that you don't need to spend a fortune on a custom wardrobe, we were the first company to disrupt the retail sector by making perfect-fitting, personalized apparel on a mass scale. Customers take on the role of designer, picking out every minute detail of their suits and shirts to make them truly one-of-a-kind. These garments are made to their precise measurements and shipped directly to their door, hassle free. Our omnichannel approach allows them to shop online or in person at any of our showrooms. MediaPost: How Many Stores Does A Digital Brand Need? Lavender Online: Salt And Pepper Say "I Do"
Lavender Magazine - Online: Salt And Pepper Say "I Do"
Green Wedding Shoes: Step On Up, Grooms! The Green Wedding Shoes x The Tie Bar Collection is Here! The Daily Front Row Online: Media Moves: Changes at Vogue, Ferragamo, and MORE! The Plunge: How Much Does a Wedding Tuxedo Cost — for Rental and Purchase? 4 Ur Space: Indochino is Expanding its Store Portfolio and Product Offerings. Portland Business Journal: A look at this week's real estate goings-on. Internet Retailer: Indochino plans to open 20 showrooms this year. Here's why. Fashion United: The showroom model: will brick and mortar stores carry inventory in the future? Good Morning America: Enter 'GMA' Ties the Knot with Jessica Mulroney! Daily Star.UK: Meghan Markle commits huge fashion sin during uni visit – can you spot what it is? Aventura Magazine: Hot Sheet: Indochino men’s apparel arrives at Aventura Mall. VMSD: E-Tailer to Retailer: Is it Worth It? BC Business: Whisky Wisemen promises an "exceptional event, the likes of which Vancouver has not seen before"
Forbes: How Indochino Personalized The Tuxedo On A Mass Scale. Retail Wire: Can retailers appeal to both ‘fast’ and ‘slow’ shoppers? MR Mag: INDOCHINO Receives Strategic Investment From Mitsui & Co.
Pagan Research: 60 Startups in Canada That Are Globally Well Known! Cool Mom Picks: All the best deals for Black Friday 2017 right in one place! 4URSPACE: Indochino Continues its Expansion Into Physical Retail. Real Men Real Style: 55 Black Friday Deals You Don’t Want To Miss! Igee Okafor: Here's What INDOCHINO is offering this Black Friday. Hurry! Business In Vancouver - Roundhouse 98.3: BIV on Roundhouse September 11: Does Vancouver have a shot at landing Amazon? Total Retail: The Future of Online Retail is … Offline? Bonne NY: Don't Walk, Run! INDOCHINO Is Having A Sale! Chain Store Age: First Look: Indochino, King of Prussia, Pa.
Green Wedding Shoes: Colorful + Iridescent Wedding Inspiration With Bubbles! BCBusiness: Work in progress: 27 events that changed business in B.C. MRVL Style: Interested in an affordable made to measure suit? Yahoo Finance: INDOCHINO Announces 2017 Retail Expansion Plans With Eight New Showrooms in Canada and U.S. Beyond: What is the Future of Retail? Financial Buzz: INDOCHINO Announces 2017 Retail Expansion Plans With Eight New Showrooms in Canada and U.S.
MarketWired: INDOCHINO Announces 2017 Retail Expansion Plans With Eight New Showrooms in Canada and U.S.
Bargain Moose: Indochino Black Friday Sale is Now On!!!! Inside Hook: Made-To-Measure Overcoats, Off-The-Rack Prices. Get One. USA Today: What's inside the MTV Video Music Awards celeb gift bag? Gear Patrol: Can Made-to-Measure Suiting Be Reasonably Priced? Essential Marketing Planning: Do online stores need a physical presence? Techvibes: Can Cognitive Computing Leapfrog Omnichannel Marketing Platforms? Who Got Funded: Indochino raised $30,000,000 on March 10th, 2016, from Dayang Group. Racked NY: Can Victor Cruz and Michael Strahan Save the New York Giants Coach's Terrible Style? Indochino Review: Huge News: Indochino to receive $30 Million investment! 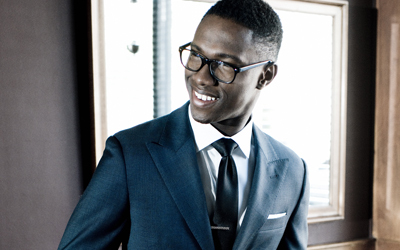 Ask Andy About Clothes: Indochino in-store events! Canadian Business: Who is... Clay Haeber? Ecommerce Illustrated: Home Page Sliders – Pass or Pause? Ask Andy About Clothes: And the results are in! — Perfect! Indochino Review: Indochino Black Friday. 70% off. Now! Ask Andy About Clothes: Indochino -- 70% off Starts Today! Bargain Moose (2): Spare Emergency Gift Ideas: Male Edition! Following high growth results, flagship showrooms coming to Chicago and Washington, DC, and second locations arriving in New York and Philadelphia this summer. The leader in made to measure debuts its most versatile line to date and brings a casual edge to tailored menswear. 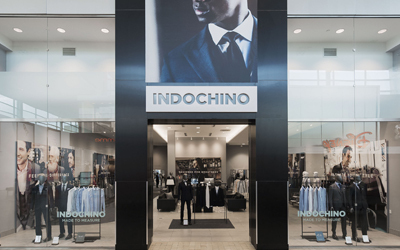 INDOCHINO ANNOUNCES 2017 RETAIL EXPANSION PLANS WITH EIGHT NEW SHOWROOMS IN CANADA AND U.S.
Online menswear brand expands into retail with Toronto Showroom opening August 1. Selection of carefully curated garments inspired by the sophisticated styles of the mid-twentieth century. Launching online May 16th, the Summer 2014 Collection offers stylish lightweight suits and shirts for work—and play. The shop on 425 King Street West aims to make getting into custom clothing more accessible. Inspired by the Rat Pack and the 60s on the French Riviera, the Spring 2014 Collection offers stylish lightweight suits and shirts for work—and play. Indochino – the leader in custom online menswear – is bringing its Traveling Tailor pop-up store back to Calgary Nov 15-24 at 237 8th Ave SE. Indochino custom menswear is proud to announce its latest offering, the Holiday Collection, which features a range of luxe options for the modern Renaissance man. Hometown hero Indochino, the leader in custom online menswear, returns home after two years to partner with the Canucks in creating this season’s premier fashion event. Indochino – the Madrona Venture Group backed custom menswear company – is bringing its Traveling Tailor pop-up store to Seattle for the first time. Designed to complement Indochino’s online shopping experience, Traveling Tailor will help men create their own made-to-measure wardrobe September 12-23, 2013, at 922 Yamhill Street. This collection offers timeless elegance with a dash of wit and whimsy in a full range of custom-made suits, shirts, blazers and outerwear—all ready to personalize. Indochino — the world leader in custom online menswear — is going offline with a pop-up store in San Francisco. New Investor Highland Consumer Fund Leads Round, Founder of Staples and Retail Pioneer, Tom Stemberg, Joins the Board. "This season, we're paying homage to the bold and rebellious mods of 1950s London who favored tailored and fully customized suits over status quo clothing and wore their personalized suits to the office, on their scooters, at dance clubs, cafes and cinemas," said Dean Handspiker, VP of Design – Product and Store Development. Core collections boast the essential elements of a great wardrobe — solid-colored suits in durable yet wearable worsted wools and wrinkle-free cotton shirts in an array of colors and patterns. It's the ultimate assortment for mixing and matching for fool-proof, versatile looks that can be worn anywhere. INDOCHINO showrooms are a living extension of our online made-to-measure experience. Customers shop by appointment with our in-house suit experts, known as Style Guides, who walk them through the steps to create a one-of-a-kind garment. All materials on this site are protected by copyright and intellectual property laws and are the property of Indochino. You acknowledge and agree that Indochino may contain proprietary and confidential information including trademarks, service marks and patents protected by intellectual property laws and international intellectual property treaties. Indochino authorizes you to view and make a single copy of portions of its content for offline, personal, non-commercial use. Our content may not be sold, reproduced, or distributed without our written permission. Any third-party trademarks, service marks and logos are the property of their respective owners. Any further rights not specifically granted herein are reserved.